Maria Montessori was born on the 31st August 1870 in the town of Chiaravalle, Italy. Her father, Alessandro, was an accountant in the civil service, and her mother, Renilde Stoppani, was well educated and had a passion for reading. The Montessori family moved to Rome in 1875, and the following year the young Maria enrolled in the local state school on the Via di San Nicolo da Tolentino. As her education progressed, she began to break through the barriers which constrained women’s careers. From 1886 to 1890 she continued her studies at the Regio Instituto Tecnico Leonardo da Vinci, which she entered with the intention of becoming an engineer. This was unusual at the time as most girls who pursued secondary education studied the classics rather than going to technical school. Upon her graduation, Montessori’s parents encouraged her to take up a career in teaching, one of the few occupations open to women at the time, but she was determined to enter medical school and become a doctor. Her father opposed this course—medical school was then an all-male preserve—and initially Maria was refused entry by the head of school. She was undeterred, apparently ending the unsuccessful interview with the professor by saying, “I know I shall become a doctor”. Eventually, it seems, Pope Leo XIII interceded on her behalf. In 1890 Montessori enrolled at the University of Rome to study physics, maths and natural sciences, receiving her diploma two years later. This and the Pope’s intercession enabled her to enter the Faculty of Medicine, and she became one of the first women to enter medical school in Italy. Montessori stood out not just because of her gender, but because she was actually intent on mastering the subject matter. She won a series of scholarships at medical school which, together with the money she earned through private tuition, enabled her to pay for most of her medical education. Her time at medical school was not easy. She faced prejudice from her male colleagues and had to work alone on dissections since these were not allowed to be done in mixed classes. But she was a dedicated student, and on the 10th July 1896 became one of the first female doctors in Italy, and with this distinction also became known across the country. In November 1896 Montessori added the appointment as surgical assistant at Santo Spirito Hospital in Rome to her portfolio of tasks. Much of her work there was with the poor, and particularly with their children. As a doctor she was noted for the way in which she ‘tended’ her patients, making sure they were warm and properly fed as well as diagnosing and treating their illnesses. In 1897 she volunteered to join a research programme at the psychiatric clinic of the University of Rome, and it was here that she worked alongside Giusseppe Montesano, with whom a romance was to develop. As part of her work at the clinic she would visit Rome’s asylums for the insane, seeking patients for treatment at the clinic. She relates how, on one such visit, the caretaker of a children’s asylum told her with disgust how the children grabbed crumbs off the floor after their meal. Montessori realised that in such a bare, unfurnished room the children were desperate for sensorial stimulation and activities for their hands, and that this deprivation was contributing to their condition. She began to read all she could on the subject of mentally retarded children, and in particular she studied the groundbreaking work of two early 19th century Frenchmen, Jean-Marc Itard, who had made his name working with the ‘wild boy of Aveyron’, and Edouard Séguin, his student. She was so keen to understand their work properly that she translated it herself from French into Italian. Itard had developed a technique of education through the senses, which Séguin later tried to adapt to mainstream education. Highly critical of the regimented schooling of the time, Séguin emphasised respect and understanding for each individual child. He created practical apparatus and equipment to help develop the child’s sensory perceptions and motor skills, which Montessori was later to use in new ways. During the 1897-98 University terms she sought to expand her knowledge of education by attending courses in pedagogy, studying the works of Rousseau, Pestalozzi and Froebel. In 1898 Montessori’s work with the asylum children began to receive more prominence. The 28-year-old Montessori was asked to address the National Medical Congress in Turin, where she advocated the controversial theory that the lack of adequate provision for retarded and disturbed children was a cause of their delinquency. Expanding on this, she addressed the National Pedagogical Congress the following year, presenting a vision of social progress and political economy rooted in educational measures. This notion of social reform through education was an idea that was to develop and mature in Montessori’s thinking throughout her life. Montessori’s involvement with the National League for the Education of Retarded Children led to her appointment as co-director, with Guisseppe Montesano, of a new institution called the Orthophrenic School. The school took children with a broad spectrum of disorders and proved to be a turning point in Montessori’s life, marking a shift in her professional identity from physician to educator. Until now her ideas about the development of children were only theories, but the small school, set up along the lines of a teaching hospital, allowed her to put these ideas into practice. Montessori spent 2 years working at the Orthophrenic School, experimenting with and refining the materials devised by Itard and Séguin and bringing a scientific, analytical attitude to the work; teaching and observing the children by day and writing up her notes by night. The relationship with Giusseppe Montesano had developed into a love affair, and in 1898 Maria gave birth to a child, a boy named Mario, who was given into the care of a family who lived in the countryside near Rome. Maria visited Mario often, but it was not until he was older that he came to know that Maria was his mother. A strong bond was nevertheless created, and in later years he collaborated and travelled with his mother, continuing her work after her death. In 1901 Montessori left the Orthophrenic School and immersed herself in her own studies of educational philosophy and anthropology. In 1904 she took up a post as a lecturer at the Pedagogic School of the University of Rome, which she held until 1908. In one lecture she told her students: “The subject of our study is humanity; our purpose is to become teachers. Now, what really makes a teacher is love for the human child; for it is love that transforms the social duty of the educator into the higher consciousness of a mission”. During this period Rome was growing very rapidly, and in the fever of speculative development, some construction companies were going bankrupt, leaving unfinished building projects which quickly attracted squatters. One such development, which stood in the San Lorenzo district, was rescued by a group of wealthy bankers who undertook a basic restoration, dividing larger apartments into small units for impoverished working families. With parents out at work all day, the younger children wreaked havoc on the newly-completed buildings. This prompted the developers to approach Dr Montessori to provide ways of occupying the children during the day to prevent further damage to the premises. She put many different activities and other materials into the children’s environment but kept only those that engaged them. What Montessori came to realise was that children who were placed in an environment where activities were designed to support their natural development had the power to educate themselves. She was later to refer to this as auto-education. In 1914 she wrote, “I did not invent a method of education, I simply gave some little children a chance to live”. By the autumn of 1908 there were five Case dei Bambini operating, four in Rome and one in Milan. Children in a Casa dei Bambini made extraordinary progress, and soon 5-year-olds were writing and reading. News of Montessori’s new approach spread rapidly, and visitors arrived to see for themselves how she was achieving such results. Within a year the Italian-speaking part of Switzerland began transforming its kindergartens into Case dei Bambini, and the spread of the new educational approach began. In the summer of 1909 Dr Montessori gave the first training course in her approach to around 100 students. Her notes from this period became her first book, published that same year in Italy, which appeared in translation in the United States in 1912 as The Montessori Method, reaching second place on the U.S. nonfiction bestseller list. Soon afterwards it was translated into 20 different languages. It has become a major influence in the field of education. On 20th December 1912 her mother died at the age of 72. Maria was deeply affected by this event, and in the year following her mother’s death she brought her 14-year-old son, Mario, to Rome to live with her. A period of great expansion in the Montessori approach now followed. Montessori societies, training programmes and schools sprang to life all over the world, and a period of travel with public speaking and lecturing occupied Dr Montessori, much of it in America, but also in the UK and throughout Europe. By this time Montessori had given up her other commitments to devote herself entirely to spreading the approach she had developed. Much of the expansion, however, was ill-founded and distorted by the events of the First World War. On returning from the USA in 1917, and after Mario’s marriage to his first wife, Helen Christy, she based herself in Barcelona, Spain, where a Seminari-Laboratori de Pedagogiá had been created for her. Her son and his new wife joined her, and her four grandchildren spend their formative years there: two boys, Mario Jr and Rolando, and two girls, Marilena and Renilde. 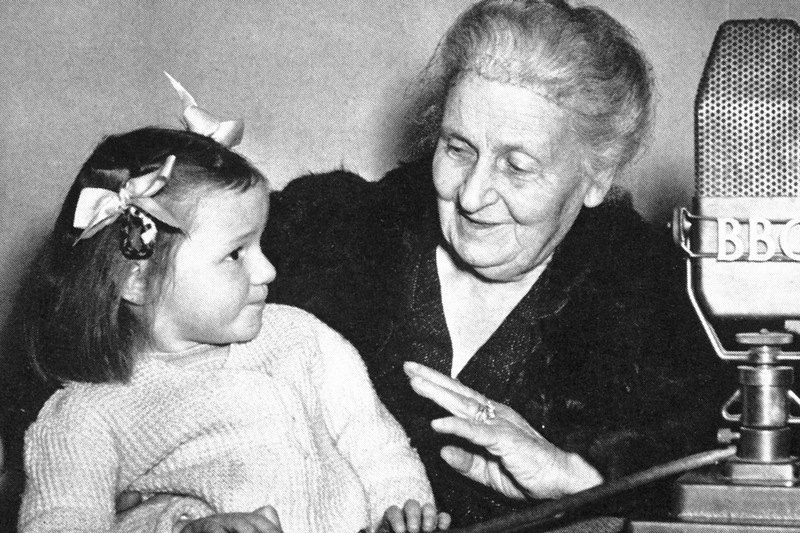 Renilde, her youngest grandchild, was until 2000 the General Secretary and then President (until 2005) of the Association Montessori Internationale, the organisation set up by Maria Montessori in 1929 to continue her work. Maria nursed an ambition to create a permanent centre for research and development into her approach to early-years education, but any possibility of this happening in her lifetime in Spain was thwarted by the rise of fascism in Europe. By 1933 all Montessori schools in Germany had been closed and an effigy of her was burned above a bonfire of her books in Berlin. In the same year, after Montessori refused to cooperate with Mussolini’s plans to incorporate Italian Montessori schools into the fascist youth movement, he closed them all down. The outbreak of civil war in Spain forced the family to abandon their home in Barcelona, and they sailed to England in the summer of 1936. From England the refugees travelled to the Netherlands to stay in the family home of Ada Pierson, the daughter of a Dutch banker. Mario, by now estranged from his first wife, was later to marry Ada. In 1939 Mario and Maria embarked on a journey to India to give a 3-month training course in Madras followed by a lecture tour; they were not to return for nearly 7 years. With the outbreak of war, as Italian citizens, Mario was interned and Maria put under house arrest. She spent the summer in the rural hill station of Kodaikanal, and this experience guided her thinking towards the nature of the relationships among all living things, a theme she was to develop until the end of her life and which became known as cosmic education, an approach for children aged 6 to 12. Montessori was well looked after in India, where she met Gandhi, Nehru and Tagore. Her 70th birthday request to the Indian government—that Mario should be released and restored to her—was granted, and together they trained over a thousand Indian teachers. In 1946 they returned to the Netherlands and to the grandchildren who had spent the war years in the care of Ada Pierson. In 1947 Montessori, now 76, addressed UNESCO on the theme ‘Education and Peace’. In 1949 she received the first of three nominations for the Nobel Peace Prize. Her last public engagement was in London in 1951 when she attended the 9thInternational Montessori Congress. On 6th May 1952, at the holiday home of the Pierson family in the Netherlands, she died in the company of her son, Mario, to whom she bequeathed the legacy of her work. Julia Maria, “’Le Feminisme Italien: entrevue avec Mlle. Montessori”, L’Italie, Rome, August 16, 1896. Quoted in Rita Kramer, Maria Montessori: A Biography (Chicago 1976), p. 52. Maria Montessori, Pedagogical Anthropology (New York 1913), p. 17. Quoted in Kramer, p. 98. E.M. Standing, Maria Montessori: Her Life and Work (New York 1984), p. 38.